It was raining heavily when I arrived at Habitat for Humanity ReStore at 29 Bryant Road, Te Rapa, Hamilton to dispose of the old computer gear. All superbly organised and executed if a little somber – I was in and out in five minutes. 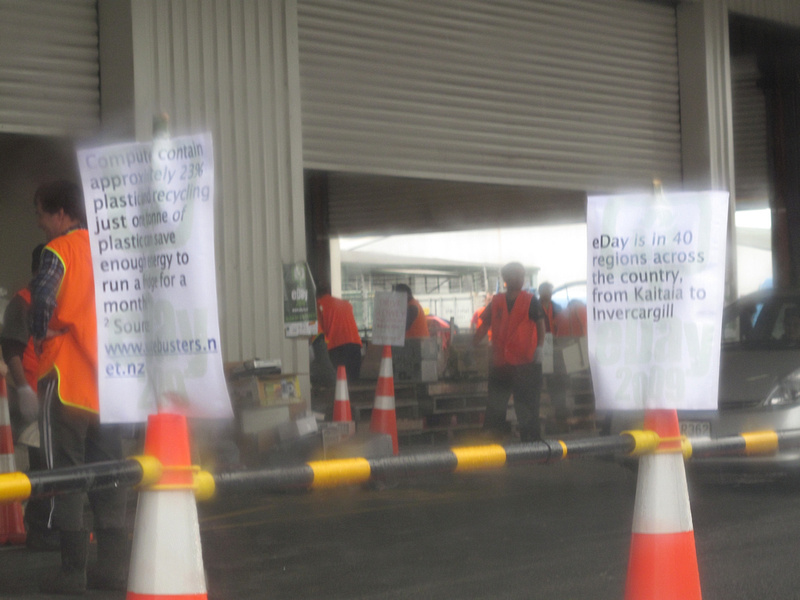 Admittedly, after nearly five hours – the time stamp on this file says 13:44 – the excitement of recycling may have begun to pall somewhat – and yes it was raining. Cheers to the lovely lady directing traffic at the turn and singing in the rain. My gripe remains – the pre event publicity slipped through my net and I had been looking out for it – compounded by Waipa District plumping for the previous weekend – why? Others, variously wired, spoken to subsequently were unaware of the event. I guess I should have signed up at http://www.eday.org.nz/about-eday/sign-up-for-eday-updates.html. BTW this was my third eDay.